Safe hands from DDG. How many more times he’ll have to rescue his club? It’s been a year and eight months now. Roughly £300 million have been invested in the squad which, even before that, already featured the likes of Anthony Martial, David de Gea, Juan Mata, Ander Herrera and Marcus Rashford. One world transfer record has been broken; another big purchase has made it into the top ten of most expensive aquisitions in history. Recently, £100,000 worth of weekly wages has been spent on securing the services of Jesse Lingard and £500,000 went Alexis Sánchez’s way. Globally and historically, only two or three football clubs have ever tried this hard. And yet, Manchester United are still in purgatory. Make no mistake about it: Sevilla were playing very well. Faced with the obligation to attack, they’ve settled for a 4-2-3-1 with two Argentinians, Joaquín Correa and Franco Vázquez, constantly providing support to Luis Muriel. Especially Vázquez will have reasons to be angry with himself – on one occasion, all he had to do was to control a through ball with his left foot. Instead, he let the ball go far too wide and, by the time he picked it up, Chris Smalling has caught up with him. Alas – that was only one of the numerous half-chances the hosts missed. Meanwhile, the creative output of MUFC left a lot to be desired. Sánchez, operating on the left, remained so deep into Jesús Navas’ pocket, he’d actually drift towards the middle in search for space to run into. That only worked marginally better than roaming down the wing and the Chilean made way for Marcus Rashford after 75 minutes. Lukaku was even more anonymous – his only big moment came 25 minutes in, when Alexis’ long pass found him unmarked and waiting. His decision to attempt an immediate volley was probably correct. Unfortunately – instead of copying Robin van Persie’s ancient effort against Aston Villa, the lad from Lierse found the stands. From a tactical point of view, yesterday’s match closely resembled Liverpool circa April 2014. Just like Mourinho’s Chelsea that spoiled Scousers’ title party, United have come out with an utterly negative gameplan, benching both Pogba and Martial and unleashing the most uninspired version of 4-3-3. 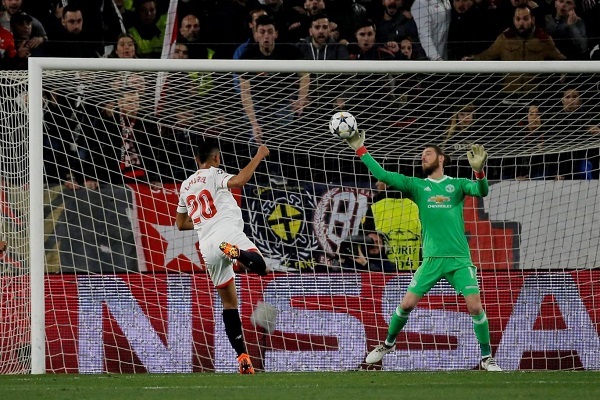 Once again, it’s been a persistent onslaught by the home side with 25 shots for them inside 90 minutes; once again, José’s goalkeeper (originally – Mark Schwarzer; yesterday – David De Gea) needed an 8-save, brilliant performance to keep their team alive. 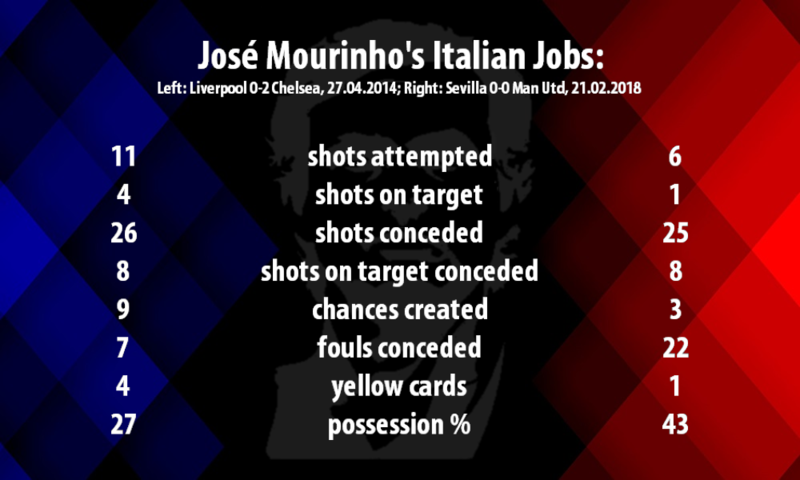 Once again, The Special One has turned out to be a party pooper. There are differences, though. The 2014 Chelsea has come to Anfield with 35 years old Frank Lampard in midfield, 33 years old Ashley Cole at left back, serial benchwarmer Demba Ba upfront and inexperienced Tomáš Kalas filling injured John Terry’s boots. They were freshly off a shocking 1-2 home defeat to Sunderland that saw them wasting thirty (!) goalscoring chances and effectively ruining their last title hopes. Apart from dignity and a highly unlikely second-place finish, they’ve had nothing to play for. They’ve ended up winning 2-0, though. Four years later, Don José had the luxury of benching Paul Pogba and Anthony Martial at Estadio Ramón Sánchez Pizjuán. He was in front of the opponent that occupies only the fifth place in La Liga and needed a second-half miracle to rescue a home point against Liverpool back in November. Instead of a backup forward with 43 Premier League goals across the previous five seasons, Mourinho had a star striker with 80 league goals in a similar time-frame. United still didn’t score a goal; Lukaku was far less threatening than 2014 Ba. The boss at Old Trafford will obviously have a dozen of excuses prepared in his defense. First and foremost: the result. Los Rojiblancos have failed to capitalize on their home advantage and will now go somewhere in Europe, to an away game, which they’ll absolutely dread to take part in. This year, The Theatre of Dreams has only been captured by relentless Manchester City and the team that fell 1-5 to Spartak Moscow, 0-4 to Valencia, 0-5 to Real Madrid, 1-3 to Real Sociedad and 1-5 to Eibar while on the road is the last candidate to win in northern England – the fact which, in a way, heavily validates MU’s Wednesday effort. Eibar 5 Sevilla 1. Not the first and certainly not the last away smackdown for Vincenzo Montella’s lads. Then, there’s the Pogba conundrum. After a dismal performance against Newcastle United, the Frenchman reportedly suffered an illness and hasn’t been fit to start this match. But when Ander Herrera’s 15th minute backheel attempt resulted with the Spaniard tweaking his hamstring, it was Pogba, who’s been trusted as a replacement. Not under as much pressure to perform as in the previous couple of weeks, United’s most expensive player ever finally produced a quality performance, misplacing only 5 passes during his 73-minute shift. Finally, David De Gea. We all already knew what this man is capable of. Since 2013, he’s captured Sir Matt Busby Player of the Year award three times, only borrowing it once to Ander Herrera last season. This time, after his sensational performances against Arsenal, Bournemouth, Southampton and the one at Sevilla last night, there’s no way anyone could steal this award from him. How on Earth did he manage to push away Muriel’s 45th minute free header from just 6 yards out? That will forever remain his secret. In a post-match press conference, Mourinho did everything in his power to sweep all issues with United’s performance under the carpet. First, he completely twisted the question about tactical instructions for Alexis Sánchez, turning it into a dig against journalists who expect wingers to be freed of of defensive tasks. Then, he navigated around the Pogba discussion by praising Scott McTominay’s mildly satisfying performance to heavens. He ended this publicity farce by expressing satisfaction in the way his players dealt with Éver Banega – playmaker, who on the night, created 10 (!) chances, completed 87 passes and hasn’t been dispossessed once. All in all, yet another masterclass of aggressive deflection from José – leaving pretty much all uncomfortable questions unanswered. And there are still several questions out there. In three days, United shall take on Chelsea who just played a tactical masterclass against Barcelona and would’ve won if it wasn’t for an individual mistake by Andreas Christensen. Will the underused super-sub Anthony Martial finally get a start for this match? Will the return for newly recovered Eric Bailly prompt MU to switch into a three-man defense with Valencia and Young as wing-backs? How the team will cope with in-form Eden Hazard without Ander Herrera’s man-marking antics?